That strange time of year when we go from the finishing the Spring Marathon season (the longest distance most of us will try, unless your name is Shawn) to the start of the 5k season. You go from a long run on a Sunday to running completely out of breath over 5km a few days later. We welcomed our latest new lady Jenny on the second Mickey Edwards – perhaps not the ideal first club night but she came back again for more last Wednesday so we can’t be too bad. We have had 10 women competing in marathons with another 3 women to go during May. First of all we had Paris, Manchester and Bungay with 3 exceptionally happy ladies in Anna M, Sam, Lesley and Chusa. Standards and massive pbs all around. Anna M entered the top 10 for ladies performances for the marathon at number 9 only for Sam to knock her down to number 10 the following week. Last Sunday was the turn of London with 6 ladies, Linzi, Lynsey A, Lindsey W, Janine, Laura and Emma – all seemed happy with their achievements and it was a pleasure to cheer them round the course. Had a great day out and I hope they are all proud of themselves. Janine even got to show off her Bentley vest on the BBC when Shawn was interviewed at Tower Bridge and I hope put the disappointment of having to pull out of the Yorkshire half behind her. Although this is the ladies newsletter it would be wrong not to mention Shawn’s heroic efforts in completing 7 marathons in 7 days in 7 counties. Think he is nearing £10k in sponsorship for St Helena Hospice so an amazing effort. Really missed the regular updates this week, got very hooked. Davina is off this Sunday for her trail marathon in Wiltshire and Steph/Barbara will be at Halstead later in the month. Barbara will hope to complete her last marathon in style after having to pull out of the World Duathlon Championships in Spain due to extreme weather conditions and the worst course she had encountered. I know how gutted she is about this and fingers crossed she will put this right this at Halstead. paying off with a big pb. Katie P, Rachel & Claire G all got pbs. Alison got a diamond standard although injured her body in the process and will sadly now have a period of time out of action. Pauline and Karen also carved off big time chunks. Katie Ireland entered the top 10 performances for 5k at number 9 with her time for the first race and I suspect it is only a matter of weeks before she works her way up the rankings so well done you. Our modest men’s captain is unlikely to boast that he won the Flitch Way 10k so I will do it for him. Bet the bloke who came second loved the fact that Chris didn’t enter until the Saturday morning. The start of the month kicked off with the Sudbury 5 where Claire G, Tricia, Debs and Sue S all ran. Claire got her first bronze standard (although she now has 2, getting greedy!!) and Tricia got silver. Debs was pleased to get round and Sue put in a strong race. This was followed later in the bank holiday weekend with the lovely Easter Bunny doubles – must thank the Easter bunnies, Des, Theresa and their helper Lorna this year for a great morning/lunch. What a feast again. Marion won the golden bunny and Milly won a large bunny for the Junior Race. We are still wading through the chocolate at home and packed lunches were much more exciting than normal the following week. We still have a loyal band of parkrun supporters and the GBRC vest appeared at Barnstable and South Manchester this month. Helene took part in the Bletchey Enigma coming second and Willow survived the Gauntlet. Natalie also had a good run at the Bungay Half. And now to my Runner of the Month – this month has been relatively easy (although I hope that doesn’t upset the rest of you who also performed so well) as I have wanted to award this lady for months for the progress she has made. However I felt she needed to come to the end of the long journey she was on. After telling me before Xmas that she couldn’t possibly run a marathon and she doubted her ability to even get round by walking/running, she ran every single step at London on Sunday. 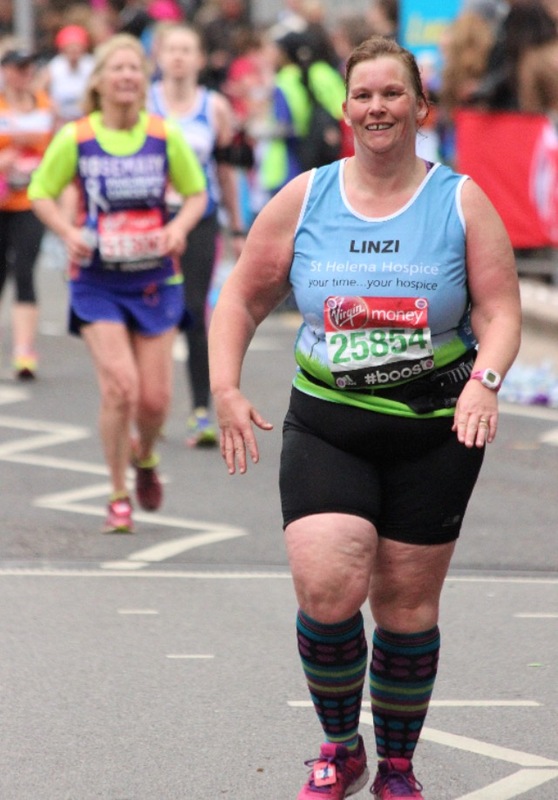 She is a fantastic member of the club, so supportive of others and I felt so proud of her as we cheered her around the course on Sunday so….. LINZI IDDON, you are finally and definitely my Runner of the Month for April. Bye for now and happy running. Breakfast run on Sunday at Alton Water – you only have the rest of the day to order your breakfast from Luke, Claire or Karen! !